The most intriguing player returned to the Phillies from the Astros in the Ken Giles trade is 2013 #1 overall pick Mark Appel. 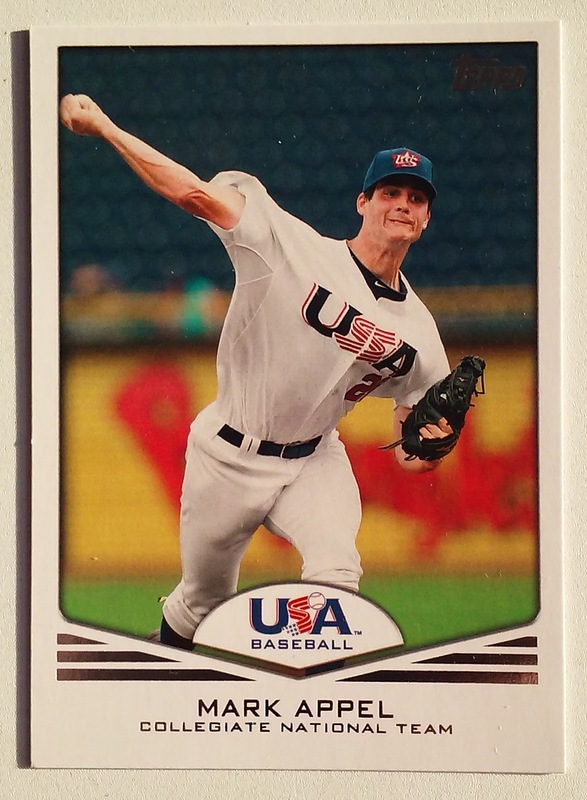 Mark Appel has been unable to match the off-field hype during a professional career that now stands at 250+ innings with a cringeworthy 5.12 ERA. That is not a small sample size although Appel did show modest improvement posting a 4.37 ERA across two levels in 2015. Topps USA is a61 card set with a couple of players that have already emerged. Notable Pre-RCss other than Appel in the set are Michael Wacha, Addison Russell, Joey Gallo, and Kevin Gausman. In 2010 Topps produced a similar set that included Gerrit Cole and others. 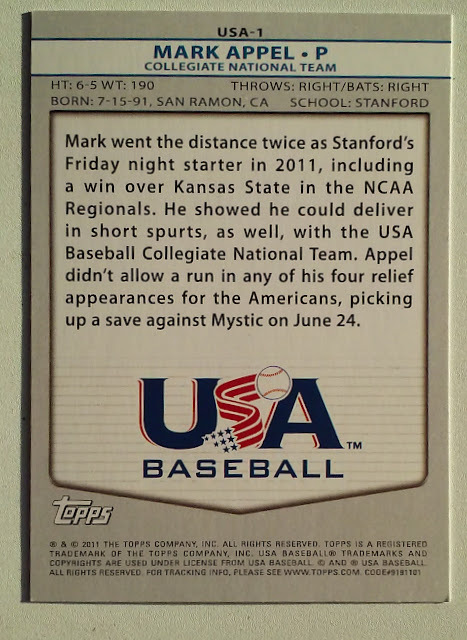 Mark Appel got card #1 in the set because he is listed first among Collegiate National Team players alphabetically, not because he was the #1 draft pick or #1 prospect. Text on the back of the card mentions Appel's accomplishments at Stanford and Team USA. Last season I tried to project the WAR of the 2015 Phils and came up with an incredibly optimisting 70+ Wins - but I think that was dependent on a deluded idea that Chase Utley was returning to form and that Cliff Lee had a shot to be healthy. I will attempt to do the same this off-season. I see Mark Appel will appear in the Major leagues late in 2015 but his contributions will be minor. +0.0 WAR is my projection for his first Phillies foray. As more WAR Projections get posted I will Index and total them similar to the 2015 list. 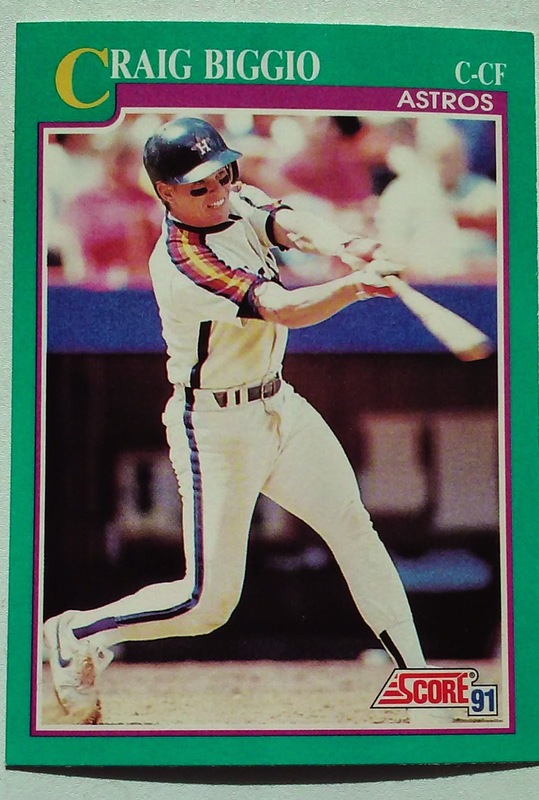 Just noticed on Twitter that Hall of Famer Craig Biggio is celebrating a Milestone Birthday today. I am a fan of the early Biggio cards. Anytime I see one in a dimebox that identifies him as a catcher I will pick it up. 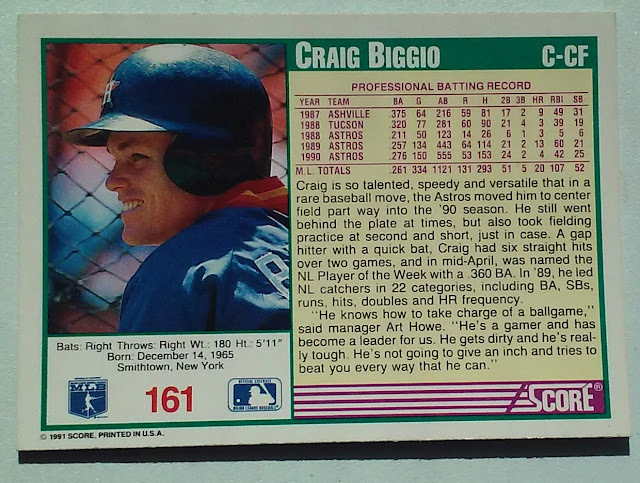 1991 Score captures the young Craig Biggio during his first position switch to Centerfield. The C-CF on the card has to be an on card rarity. First you have the positions involved, how many Catchers are speedy enough to play center. 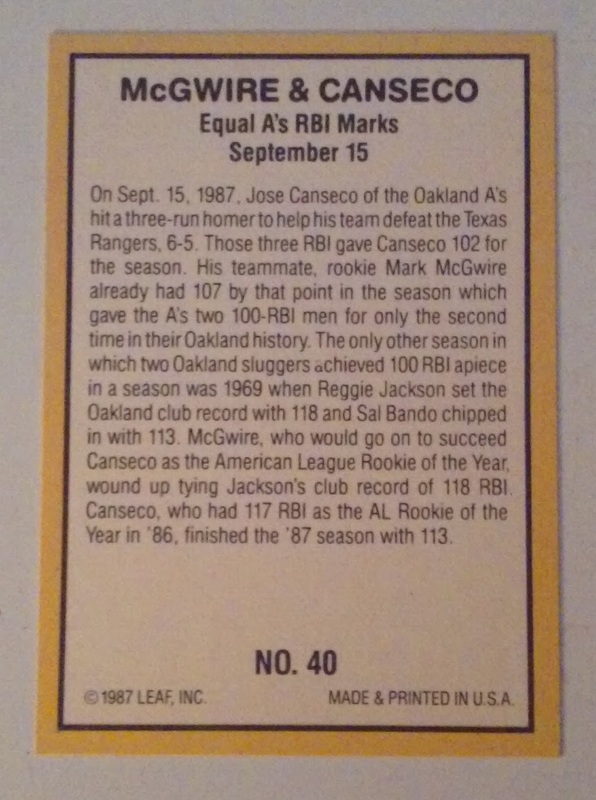 Secondly you have Score differentiating the specific Outfield position - something that Topps (and others) still don't bother with a quarter century later. 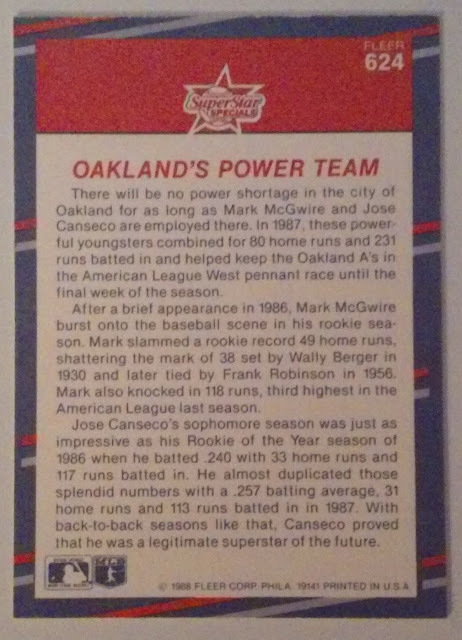 Along with several other accolades the text on the flip side mentions Biggio's unique position change. Nice guest appearance from Moneyball Manger Art Howe with the Quote. Yesterday we covered Chan Ho Park's HoF (lack of) candidacy. Today I just want to add some proof that he spent 15 minutes in the Phillies organization. Just posting this to note that it is interesting that Chan Ho Park owned slugger Miguel Tejada. Prior to coming to Philadelphia Park was basically a starter. With the Phillies he was relegated to spot relief. The Second Phungo set was released in 2010. 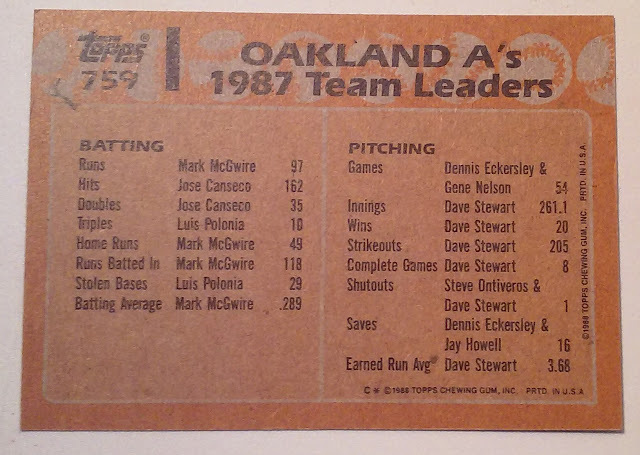 The 52 card checklist is presented below, card #48 is unknown - I may have never produced one. With Korean First Baseman Byung Ho Park signing with Twins I thought it was a good opportunity to discuss Chan Ho Park in our HoF Ballot Series. Unfortunately the BBWAA committee that is responsible for creating the Ballot did not see the need for that discussion. Park fulfilled the 10 year experience quota but was left of this years ballot - Jay Jaffe noted in an SI Article that for a number of reasons Park was the biggest snub on this years ballot. 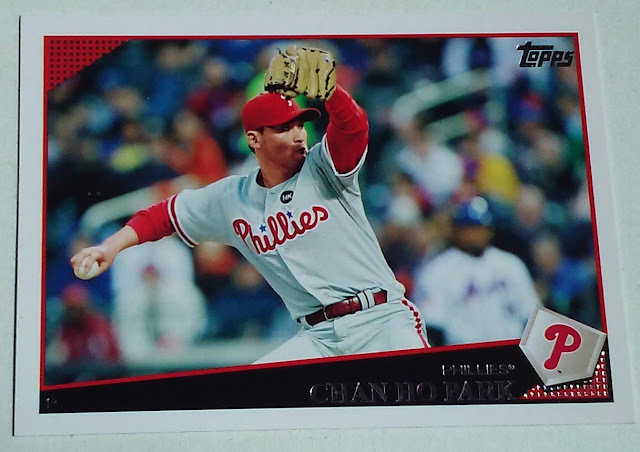 Chan Ho Park was the first Korean Player to make it in the states, as more of his countrymen Join MLB teams the significance of his career will grow. Ok - I'm Asian and I feel for the Snubbed guy. 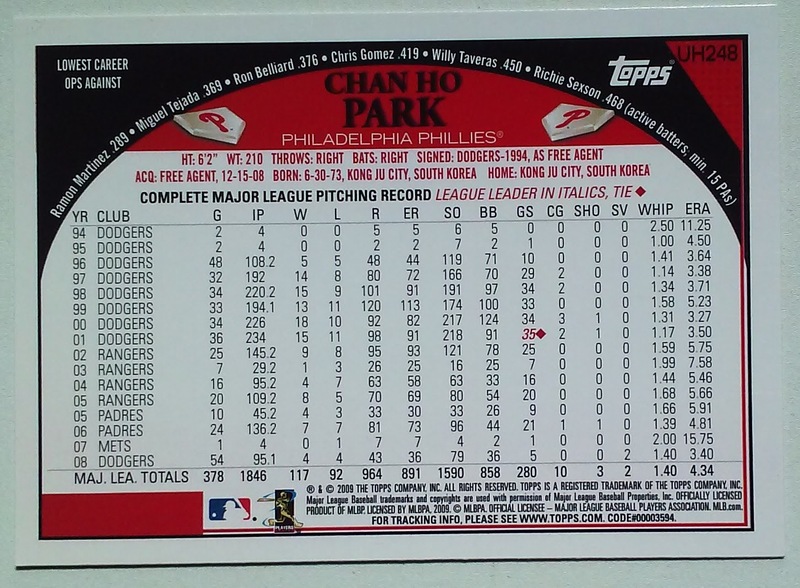 To be honest Chan Ho Park's year with the Phillies was pretty mediocre as was his career. Great thing about writing a blog is I can Put Chan Ho Park in the HoF and blow off Mark McGwire. Trading Card Show that is. I have never seen the movie "Rudy" in it's entirety, but I probably don't need. Lifelong passions as a Sports and Pop Culture Nerd have probably fed the entire script of the film into my brain stem. The 1993 movie is based on the story of the undersized Rudy Ruettiger who was a walk on for a single game with the 1975 Notre Dame Fighting Irish. 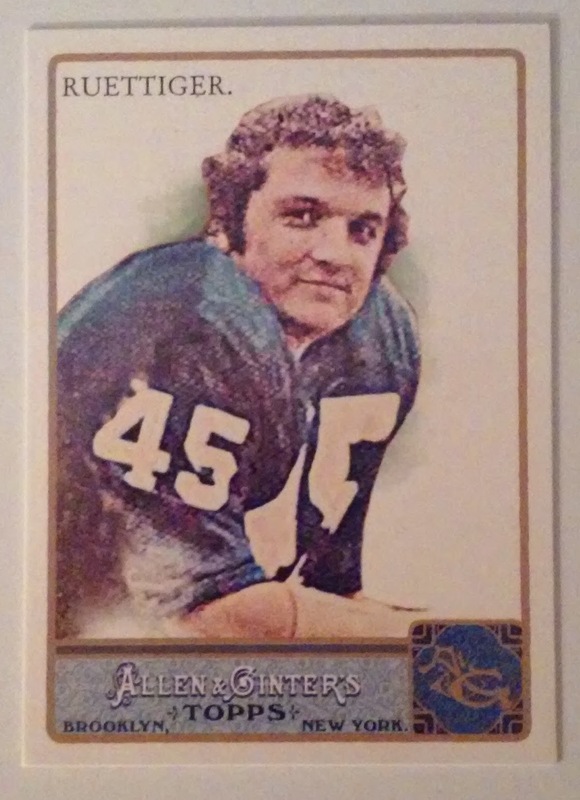 Rudy is one of about a half dozen guests slated for this Saturday December 5th at the Valley Forge Card Show. His signature will command $50 plus an additional $25 for an inscription. The top Baseball Signers include Hall of Famers Rickey Henderson and Steve Carlton. The Phillies related folks are Charlie Manuel, Jimy Williams, Curt Schilling, Todd Pratt and Milt Thompson. Hall of Famer Paul Hornung is on the Saturday Slate for Football Fans. Friday's guest is the Flyers John LeClair while Sunday will feature US Women's National Team Soccer Gold Medalist Heather Mitts. Donovan McNabb was originally on the Weekends Roster but has other obligations in Arizona. Bit of an oddity here but since AnG traditionally only lists the subjects last name we don't get to see Ruettiger signature Name "Rudy" on the front of the card. Not sure if I am making this year's show, busy time of year and I should really just organize the cards from the last show I was at back in October. If I do go it will likely be Saturday. Mark McGwire appears on the Hall of Fame ballot for his 10th and Final Time this year. Due to some recent changes to the voting process McGwire will not get the opportunity to hang around for five more election cycles. And I am sure there are more - given the era I assume there are lots more. Kind of curious that in all three cards the two players appear in the same order. 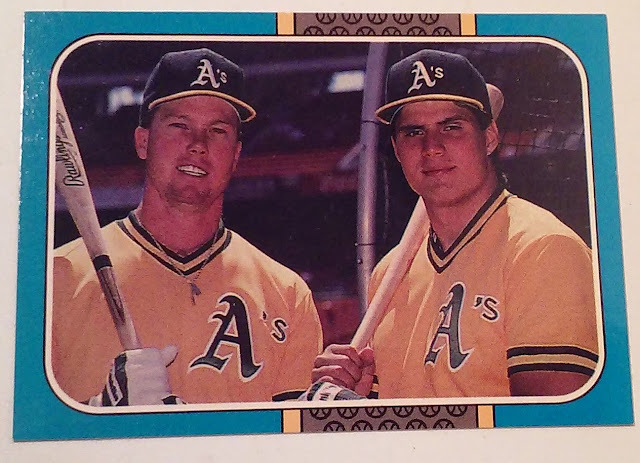 I thought the latter two shots may have been at the same session but Jose Canseco is wearing different arm bands in each photo. Unlike many fans the marriage of Steroids/PEDs and Baseball have made my life less difficult rather than more complicated. First off I don't get excited over HoF results, I think they are fun to follow and generate interesting conversations. Secondly it allows me to be arbitrary for no real good reason as to whom I put into the Phungo Hall. And you know what - I dislike Mark McGwire. Having steroids out there lingering is a nice bonus to justify a NO Vote on my HoF ballot. 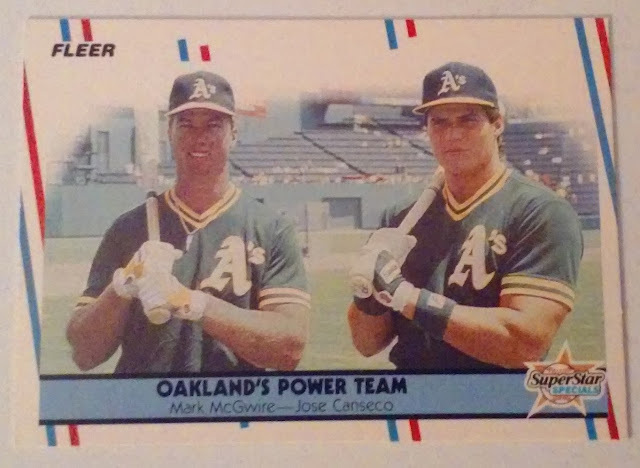 Beyond that I think of McGwire as a marginal HoF candidate. He is probably just over the line stat-wise. Despite his 583 Home Runs among the 19 HOF first baseman McGwire ranks just a tick below the groups average in WAR scores for all three JAWS categories (WAR, WAR7 and JAWS). Primarily known as an offensive threat at a power position McGwire never won an MVP award. He did finish 2nd to fellow PED suspect Sammy Sosa in 1998 despite having a higher WAR than the Cubs outfielder - Both Sosa and McGwire ranked behind Barry Bonds in 1998 WAR, However McGwire led the league in oWAR. 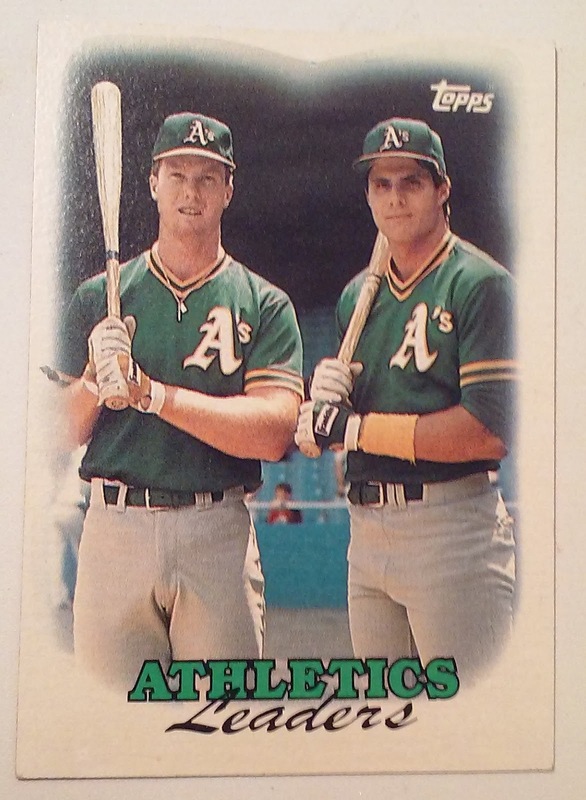 McGwire did check the Rookie of the Year box and won a pennant with the 1989 A's and was an all-star a dozen times. The text discusses the Rookie of the Year torch passing from Canseco to McGwire. Nice to see Sal Bando get a mention with all the thunder including Hall of Famer Reggie Jackson. Fleer mention of McGwire's incredible 49 Home Run rookie campaign gives them a nice opportunity to give a nod to Hall of Famer Frank Robinson. 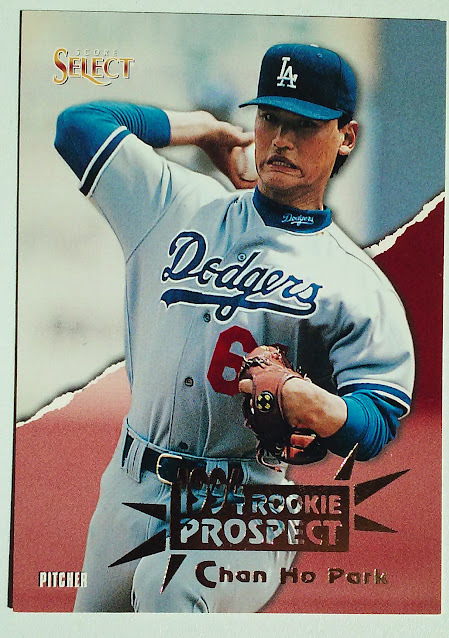 As a stat nerd I find the topps Team Leader card the most interesting. Some great names there beyond McGwire and Canseco. The Hall of Famer appearing here is Dennis Eckersley. Fellow pitcher Dave Stewart is just starting his great stretch as the A's ace. Stewarts 261+ innings ranked 8th in the majors in 1987, That would have led all of MLB every season since 2003 (Roy Halladay 266). The NL has not seen a pitcher eclipse that mark this century - Randy Johnson 271.2 in 1999. The Original Phungo set was released in 2009. The 64 card checklist is presented below, card #31 is unknown - I may have never produced one.